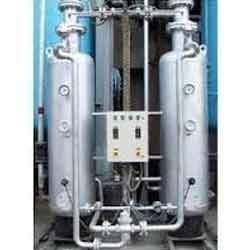 AVS Engineering Co, is Manufacturers, Exporters and Suppliers of Industrial Machinery and Dryer like all type Air Dryers. In Heatless Dryers, two vessel filled with desiccant are provided which cycle automatically, producing dry air continuously. In these units, wet air enters the bottom of one Vessel and passes upwards through the desiccant bed where the moisture is adsorbed. The dry air comes out from the top. A small portion of dry air is passed downwards through the desiccant bed in second vessel, which is under re-generation. Moisture laden purge air is then vented out to atmosphere. The purge loss is around 7.5% of the total air flow. At preset interval, the vessel changeover automatically, and Dry air is available continuously, without any surge. This is simplest type of air dryer with Activated Alumina / Molecular Sieves drying agent. This is virtually maintenance free, fully automatic, and requires no attention for year heatless type dryers do not require any heating for re-generation and therefore are very simple in design and maintenance free. · Due to its inherent simple design, investment in this type of dryer is the cheapest and the payback on this investment is very quickly. · Low Temperature operation reduces corrosion in tower and desiccant lasts longer. · Power requirement is 60 watt only for Solenoids Valves Operation. · Air Capacity: 5 to 10000 NM3/Hr. 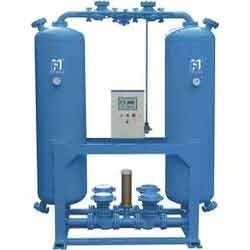 Heat of Compression / HOC Type Air Dryer. Air Capacity: 500 to 5000 NM3/hr. 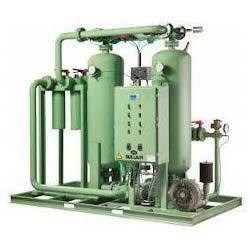 The Heat of Compression dryers (HOC) are the latest generation chemical dryers based on adsorption principle. It does not have complex valuing & is eliminated with purge loss drawback as in heatless type dryer. Cooled in cooler, then dried and before going to the outlet, cools the regenerated desiccant bed, thus bringing it down to ambient temperature. This cycle is reversed for the next 4Hrs. where the Absorber drying the air in the previous cycle goes for regeneration and vice versa. Air Capacity: 50 to 5000 NM3/Hr. For lager air drying capacities, typically above 5000 NM3/ hr we offer. 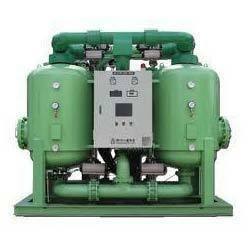 It is a skid mounted unit consisting of air-Freon chiller Air to Air pre-cooler and a moisture separator. First air is pre-cooled with outing chilled air to around 25°C and then it is cooled in a Freon cooler to (+)3°C temperature. This reduces power consumption. Outgoing dry air has (+)3°C Pressure Dew Point and comes out at around 25 C temperature. (+) 3°C Dew Point is equal to around (-) 25°C Atmospheric pressure Dew point. (-) 25°C is the best possible Dew Point achievable from Refrigerated Air Dryers. Lower Dew Point is not possible from Refrigerated Dryer as moisture condensed would start freezing on Freon tubes if lower dew point are tried. This (-) 25°C Dew Point is adequate for most dry air applications and instrument air requirements. · Air Capacity: 500 to 5000 Nm3/Hr. 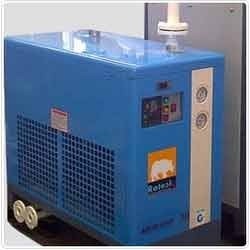 · Investment cost of these Air dryer is all most double as compared to internal heat re-activated air dryers. · It is recommended to go for this type of dryer only when loss compressed air during regeneration is not acceptable and dew point required is not critical also these are recommended for capacities above 500Nm3/hr only. Operating pressure can be from 1 to 50 kg/cm2g.